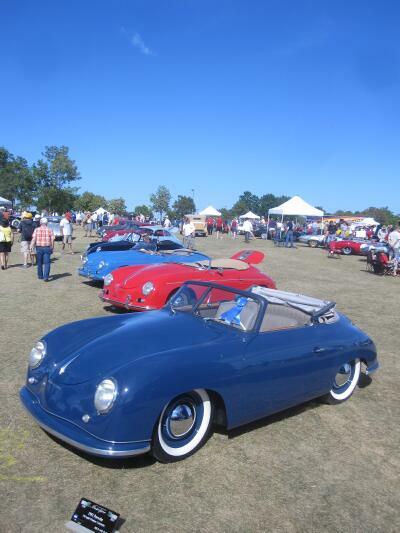 S ummer is winding down but we still have many days ahead in which to enjoy our Porsches. Your region has several events coming up, which are detailed in this newsletter. Also, we're kicking off a new section of the newsletter called Tech Tips. If you're a DIY (do it yourselfer), this feature is for you. It also may be of interest to the nonDIYs among us who are interested in how things work inside their Porsche. Check out the link to pages with photos from the Milwaukee Masterpiece -- thanks to Karl Schulz for the great pictures (one example is at the right of this column) and thanks to Lise Miley for her photos of the ALMS race at Road America. Please join us for an upcoming event. Your board and event organizers spend a lot of time conceiving and executing events that we think are of interest. Participation is the best way to tell them that they hit the mark. Sept. 10 - Half day driving tour. Starting point is Jackson, Wis., at the McDonald's at the Hwy. 60 exit off Hwy 45. Ending point is lunch at the American Club in Kohler. Led by the legendary tour meisters, the Heppe brothers. Details here. Sept. 17 - Cancelled -- Dinner at Timmers. Cancelled due to insufficient response. Oct. 2 - Cars & Coffee - Lake Mills. Car people roam around looking at cars, talking about cars. Some exotics are always there along with Porsches, of course. Coffee available for purchase on the same street. Drive out. Park. Look. Talk. Gear head nirvana. Details here. Oct. 6 - Board meeting. All members always welcome to pull up a chair. Wisconsin Club Country Club, 60th and Good Hope Rd., Milwaukee. 6:30 p.m.
Oct. 14 - Drive for Babies at Road America. A fundraiser for the March of Dimes. You should never pass up a chance to drive the world famous Road America track in our back yard. Details here. Oct. 15 - Autumn color drive to breakfast. Great roads, colorful vistas, fine-tuned Porsches, follow the leader drive, tasty breakfast. Is there a better way to spend a Saturday morning? Al Wagner is our tour meister. Details here. Oct. 14 - 16 - Rennsport Reunion. A unique event for total immersion in Porsches. Details here. Oct. 20 - Casual dinner at Tony & Mia's - Delafield. A Thursday night event at one of Delafield's newest restaurants that has received good marks from reviewers. Details here. Check out the standings for the July 3 and Aug. 21 autocross events hosted by your region. Details here. Check out a small sampling of the photos that region member Karl Schulz took at this year's Milwaukee Masterpiece. You'll find just about every model of Porsche, in a variety of colors and years. 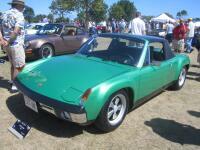 A handful of region members were part of the show, including David Hatch, whose pristine 914-6 is shown at left. Check out a few photos of the 2011 ALMS race weekend at our home track, Road America. Photo album here. If you've never attended Parade, this report captures a bit of the flavor of what happens at Parade. Sounds like Savannah was a great venue in 2011. Our online classifieds are free to members. Instructions on how to submit an ad can be found on the classifieds page. Check out the latest. In the meantime, I have found a good source for tech articles. I'll be looking for more, too. The source was recommended by my fellow PCA regional newsletter editors. We’ve formed an online forum to exchange ideas to help each other improve our region newsletters and the subject of technical articles came up. The source that several recommended is called Pedro’s Garage. Pedro is a member of PCA Gold Coast region. Many regions publish his material, which he allows regions to do, and I am going to jump on that bandwagon because his stuff is good. Check out this article on bleeding the brakes and clutch. 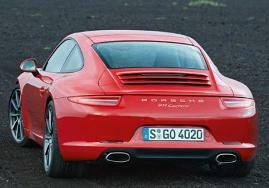 Check out this MotorTrend Hot Lap series video of the 2011 Cayman R. Randy Pobst is behind the wheel. Some dogs have all the fun. Watch this video of Jacque as she enjoys a ride in a Speedster.